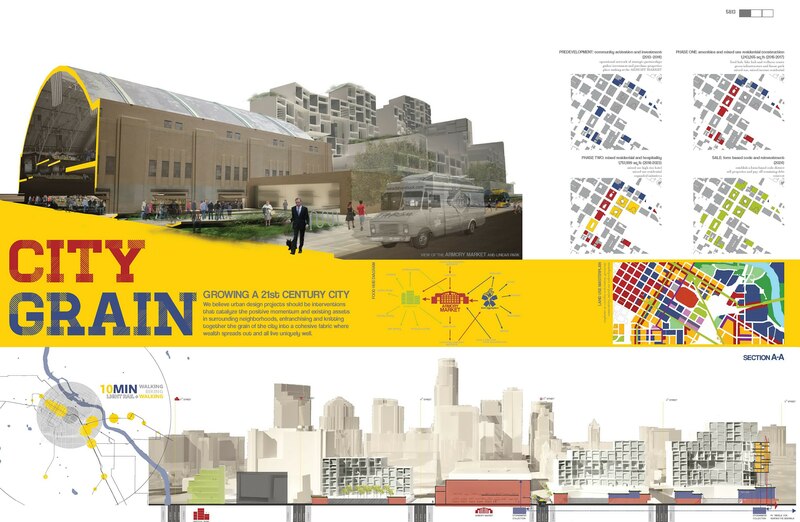 City Grain is a wellness-oriented development initiative designed to catalyze the growth of complete communities throughout Minneapolis by implementing asset-based and ecosystem interventions into the Downtown East district. Wellness is implemented in four major realms: physical, environmental, community, and economic. pedestrian connections to the riverfront. A combination of solar pv and thermal systems supply much of the energy and heating needs for the neighborhood and its larger institutions, increasing energy resilience. Home to University of Minnesota’s renowned Medical Research Center and the displays of athleticism at the Vikings stadium, physical wellness in Downtown East precedes this project. Collaborating with regional partners, City Grain seamlessly integrates athletic, ﬁtness, nutrition and local food centers. A greenway-oriented bike hub prioritizes bike transit options and access to riverfront amenities to maximize a preventive health culture. major food hub to Downtown East District pivots around adaptive reuse of the historic Armory as a fresh market serving surrounding neighborhoods and becoming a destination for the broader metro region. Developing along a viable local foods corridor, the hub includes an urban agriculture and culinary training center, composting facilities, a local food aggregator and distributor, and a commercial community kitchen for value-adding products and food truck preparations. Related micro-enterprises grow to serve mixed-use corridors along Portland Avenue, 5th Street and Washington Avenue as a core part of City Grain’s economic plan. Each phase of the development program is aimed at activating these corridors in ways that rebuild ownership and investment in the neighborhood. Additionally, a mixed-use hotel captalizes on the adjacent and newly revitalized Vikings stadium becoming an economic engine for the neighborhood as well as a destination and beacon for Viking fans and travelers from around the world. Partnerships, collaborations and good neighbors are vital to creation of community wellness. 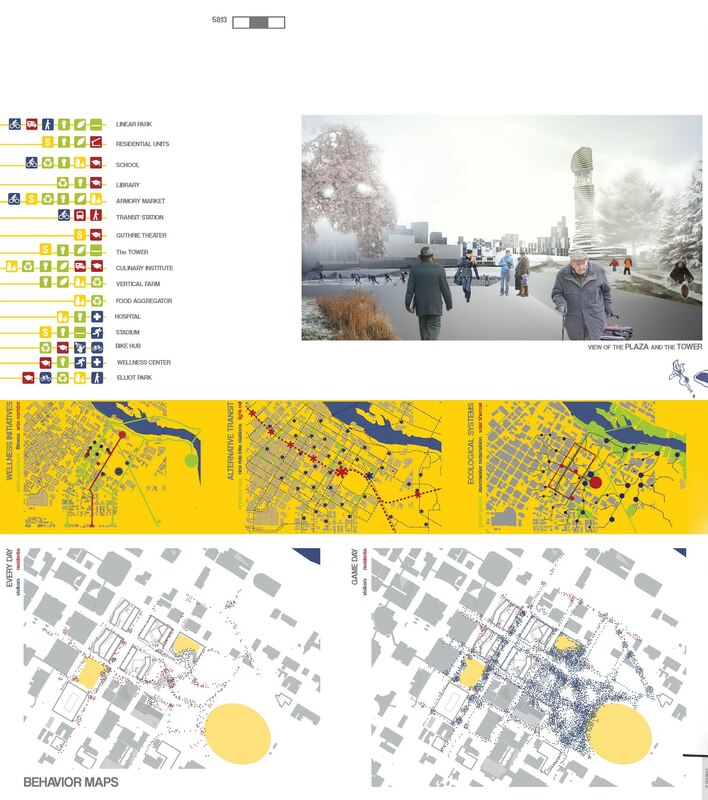 City Grain prioritizes public/private partnerships that broaden investment in the master plan. 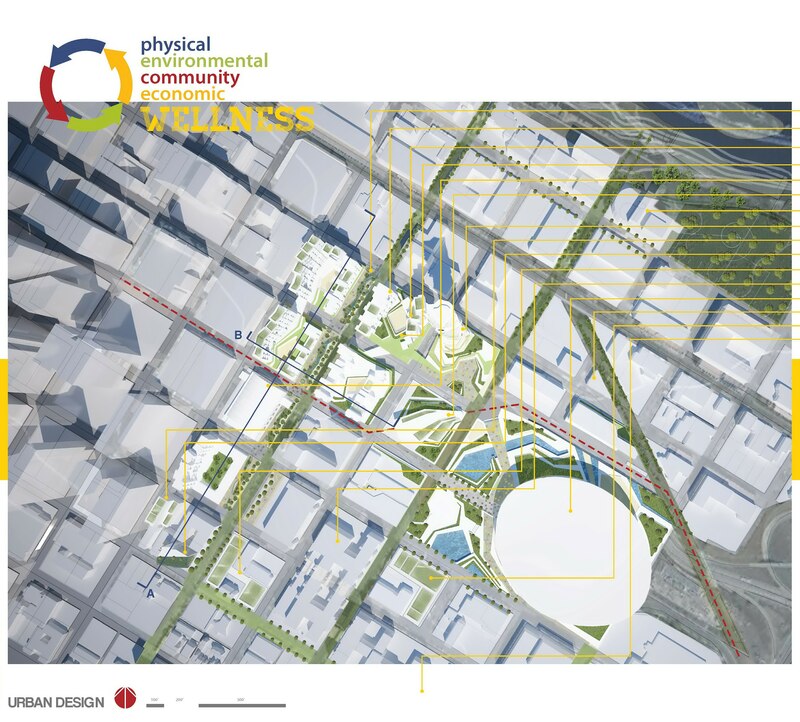 Wellness initiatives vitalize the development process by improving the lives of residents while creating amenities that will attract new residents toward a densifying neighborhood. New residential development emphasizes the creation of mixed-income live/work buildings walkable to new schools, local food, cultural experiences, greenspace and multi-modal transit options connecting to the metro region and beyond. Design strategy for new construction emphasizes responsiveness to existing architecture and form that is customizable for individualized lifestyle as well as adaptable for future growth and uses. A vision for the new Vikings Stadium encourages a year-around activated park/plaza that invites participation from surrounding neighbors and becomes public space that serves game day and every other day. Mutual investors in a vision that embraces living well in a historic and twenty ﬁrst century downtown neighborhood, this public/private support scaffolds City Grain’s $15.8 million upfront purchase of outlying properties necessary for a phased development, future sale and reinvestment strategy. Before new construction, with funding healing arts public charter school. The Amory Market becomes a familiar host to a wide range of creative community uses and events, many of which move into newly constructed buildings after phase II development. residential units extending from the Armory toward the river. New mixed use construction is home to the public charter school temporarily in the Amory, a library, athletic and ﬁtness center, artists live/work lofts and street level retail. With a strong absorption rate and national attention on the newly minted Minnesota Vikings Stadium, 2018 begins phase II of City Grains’ development strategy by establishing a mixed-use high rise tower adjacent to the stadium and the Downtown East light rail station. 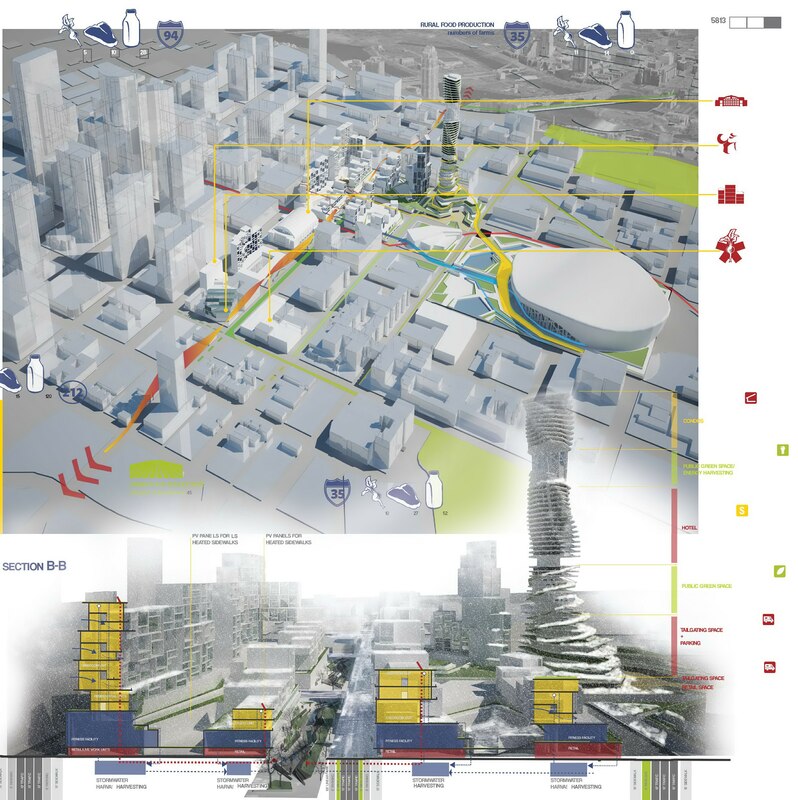 District to create a cohesive and unifi ed pattern of urban living.